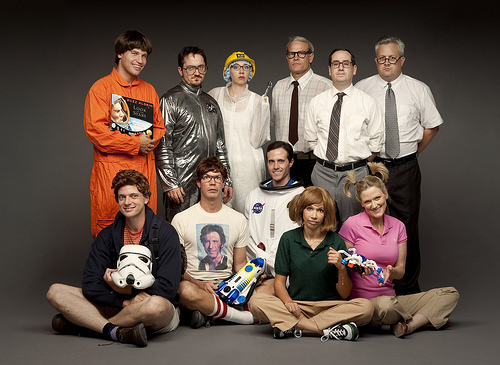 Off the bat: The Groundlings are hilarious. Theyâ€™ve earned their reputation â€“ and Iâ€™d be hard-pressed to find skits and improv of this caliber anywhere else in town. Complete with a live, spritely 3-piece band providing remixed and rearranged classics as set change music, your senses are titillated for a full 2 hours at â€œSpace Camp,â€ their latest compilation of knee-slapping skits and improv concepts. It was a privilege to see â€œSpace Campâ€ on its opening night since I was able to observe Groundlings alumni come back and support the latest effort. There were tons of faces I half-recognized â€“ and then there was Cheryl Hines who, last time I ran into her, I literally almost plowed over in a Johnny Rockets. But I felt a fly on the wall observing close family and was able to admire the tradition holding together the troupe for the past 35 years. After all, this was the training ground for a many present and past Saturday Night Live and Mad TV cast members (Jon Lovitz, Mike Myers, Conan Oâ€™Brien, Cheri Oteri, Will Ferrell, Maya Rudolph, Kathy Griffin, Chris Parnell amongst others).